Hello everyone! 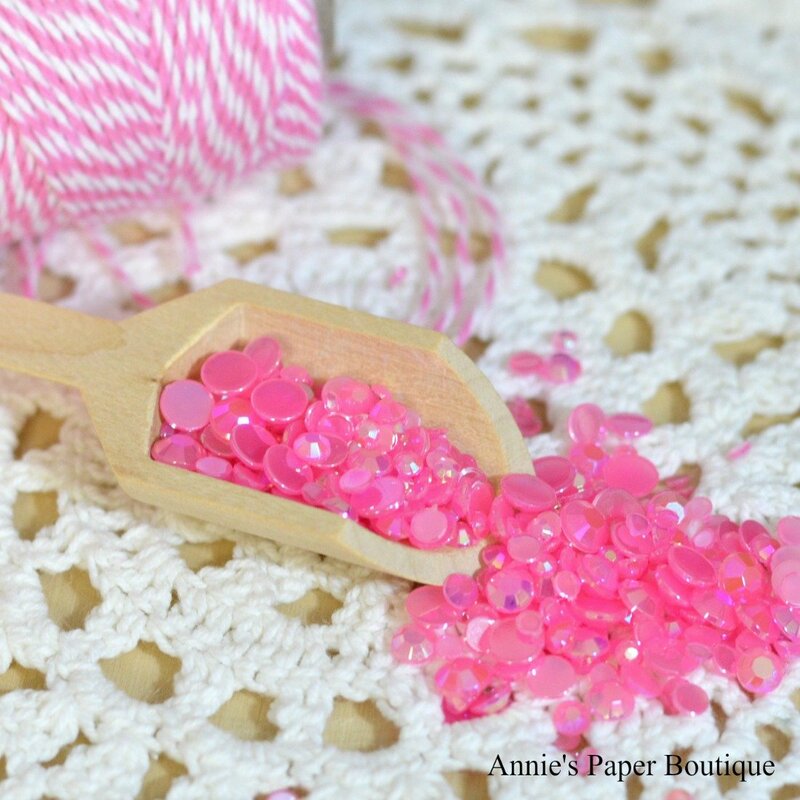 The new Pink Diamonds Sparkling Gems are featured today! These are some fun gems that you are going to want to play with. The Trendy Gals have made projects to show you how fun they are. Read down to the bottom to find out how you can win some of these new goodies! I made a shaker card to share with you today. I found a diamond cut in my Cricut library and welded the base of the die cut onto my card base. Additionally, I used a fun font and my Pink Glitter Gel Pen to write the happy birthday directly on front as well. When the base was finished cutting, I did cut out the top layer of the die cut diamond. It fit onto the the cutout very well on top of the acetate. 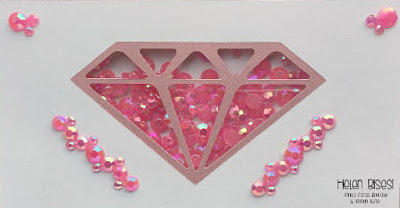 I used my foam tape around the diamond on the back of the base and I filled it with my Pink Diamonds. After attaching my top base I added more Pink Diamonds on the front. I made a pattern on the sides and added some to the top corners. Lastly, I added some Strawberry Cupcake Trendy Twine to the bottom and tied a bow. Now that you made it to the bottom, you have two chances to win some Pink Diamonds Sparkling Gems. The first way to win is to comment on all the design team blog posts and the Twine it Up! with Trendy Twine blog today--You can find all the blog links on the Trendy Blog. The second way you can win will be on the Trendy Twine Facebook Page. Make sure you leave your comments and enter on the Facebook Page before 10pm Central Time on this Wednesday, May 23rd. Oh so very awesome! Loving your card! What a great way to showcase those Pink Diamonds. I am going to have to try a shaker with them as well. Love your pretty shaker card! The pink gems are so pretty! What a fun shaker card! The pink diamonds are perfect! Oh, those make for a great shaker card! Good job! Helen, your shaker card is absolutely gorgeous! !Love the pretty gems! Your diamond shaker card is perfect! Diamonds are a girls best friend so card will be perfect for a girlfriend. Helen, this is absolutely stunning. Love the pink against the white -- it makes all that pretty pink stand out. The diamond cut out is brilliant. And the Trendy Twine bow is a nice finishing touch. on it and in it! 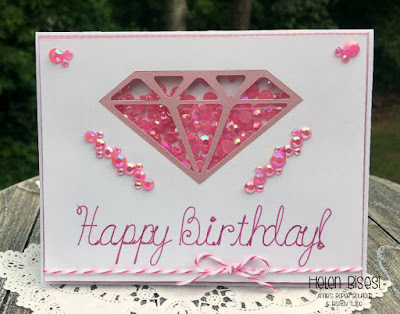 I totally LOVE your diamond design shaker card! This is dazzling with the diamond shaker and these gems.